The McCracken Research Library houses over three hundred manuscripts, archives, and photographic collections containing primary research materials. These materials are available for research by appointment. The manuscripts and archives collections contain unique, unpublished records created by organizations and individuals in the conduct of their activities. Letters, speeches, minutes, reports, writings, and other types of records document the history and culture of the American West, Wyoming, and City of Cody. Manuscripts derive from diverse sources such as pioneers and settlers, local citizens, industry leaders, western artists, naturalists, and major cultural figures. Many manuscript collections have indices and inventories available at the reference desk. A few have electronic finding aids in PDF format. For our online manuscript finding aids, click here to go to our archival collections list. Detail of a document signed by William Clark, Governor of the Missouri Territory, 1813. The collections also represent a variety of organizations, such as local advocacy groups or professional organizations. Gun and ammunition companies, such as Winchester, L.C. Smith, and Schuyler, Hartley & Graham, are also documented by extensive correspondence, reports, financial records, and other material distinctive to their businesses. Pictorial collections include a variety of material types such as photographs, slides, postcards, artworks, and ephemera. The McCracken archive houses over 500,000 documentary images. Such topics as Buffalo Bill and his Wild West show, Plains Indians, ranching, fishing and hunting industries, local history, the oil industry, cattle ranching, dude ranching and Yellowstone National Park are well represented. 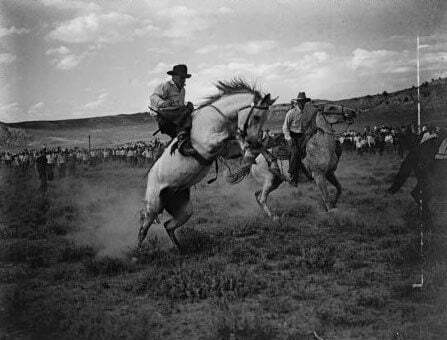 Works include Wyoming photographers Charles Belden, Stan Kershaw, Jack Richard, and F.J. Hiscock. Examples of photographic formats in this collection include black-and-white prints and negatives, glass lantern slides, stereocards, and 35mm film color slides.